Everything gets a lot more confusing in the Eastern Conference. 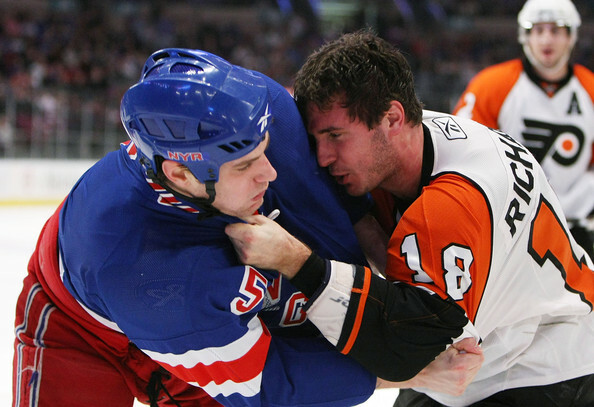 The big game of the day is the showdown between the Rangers and Flyers; winner gets in. It doesn’t get any better than this on the last day of the season. A win from either team would give them the same number of points as the Habs, so this one is going to come down to the tiebreaker system. If Philly wins, they jump Montreal and finish in 7th in the East (according to tiebreaker rule #2). If New York wins, they will have the exact same record as the Habs (39-33-10), and the tiebreaker goes to their season series. Since Montreal won the series, they would finish 7th, New York in 8th vs Washington. Boston has clinched 6th and will face either Buffalo, NJ or Pittsburgh. The 2nd, 3rd and 4th seeds were made a lot simpler with the Penguins being shutout by Atlanta last night. With that loss, they can no longer win the Atlantic Division and will face Ottawa in round 1 for the third time in four seasons. Now it just comes down to Buffalo vs New Jersey; if the Devils get a point, they finish 2nd. If Buffalo wins in regulation, they take the 2 spot. The Bruins will be watching this game closely. This entry was posted on April 11, 2010 at 10:17 am and is filed under Uncategorized with tags 2010, boston bruins, Habs, new jersey devils, new york, Philadelphia Flyers, playoffs, Rangers. You can follow any responses to this entry through the RSS 2.0 feed. You can leave a response, or trackback from your own site.